Our frame tents all have varying characteristics, but most have an inner sleeping area with sewn in groundsheet, and provide slightly more ‘civilised’ sleeping than the ridge tents. However, they are fragile and complicated to put up. 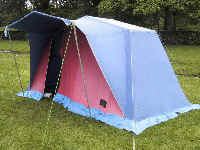 The small frame tents BE do not have an inner sleeping area, and will find particular use as a store tent as they are much smaller to transport than the other tents. In general, these tents are only for adult use.